One of the things I like best about harvesting the delicious edibles from the garden is preserving them for eating later this winter. I recently discovered a new method for shocking beans after blanching, which eliminates having to pick the ice out of the beans before freezing. My beans have struggled this season, but I have managed to have some extra to put up. Start with a BIG bowl. 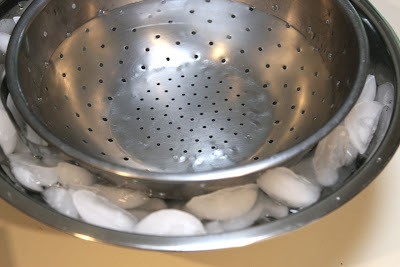 Then find a colander that will fit nicely inside the bowl, but still allows a couple of inches of room for ice. Add water to make an ice bath. 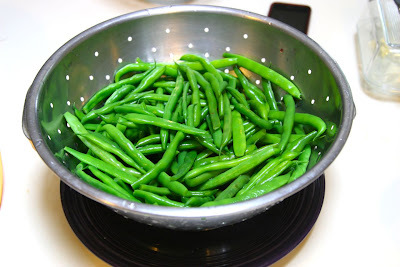 Top the beans and blanch in boiling water for about 1 minute. I do about 1/2 a pound of beans at a time. Move the beans into the ice bath for shocking. Continue adding beans until the colander is full. 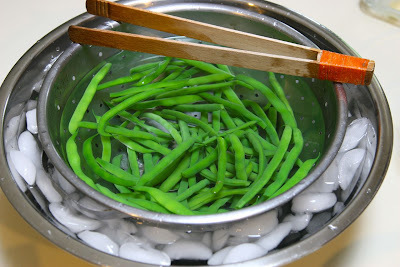 Lift the colander out of the ice bath and let the water drain from the beans. And look, no ice to pick out! Now they're ready for bagging and freezing. Enjoy your beans this winter! This post is part of Simple Lives Thursday hosted by Sustainable Eats, Gnowfglins, Culinary Bliss, and A Little Bit of Spain in Iowa. Your beans look beautiful! Wish I had planted more pole and fewer bush beans this year. I miss them! But I'm starting on winter crops early since the bush are long done now. Enjoy them this winter! Wow, what a great tip. 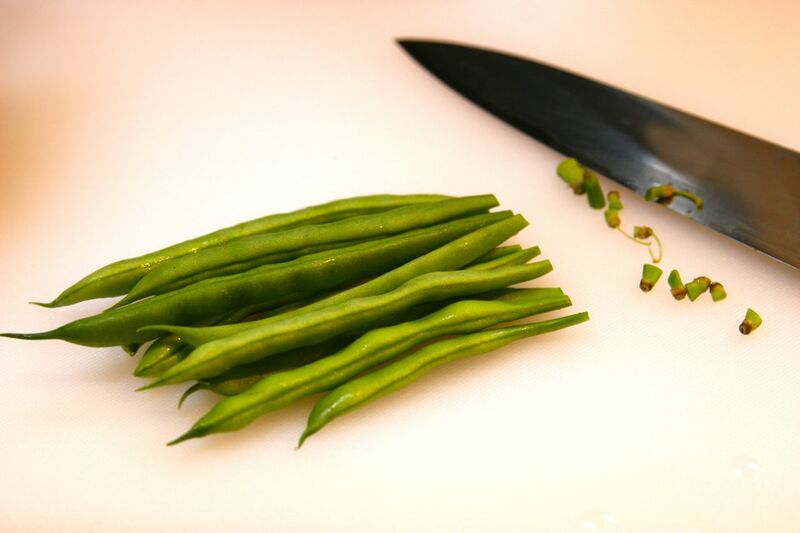 We put up a lot of edamame beans, and this would have made for a simpler process. Thank you! I LOVE your blog. Thanks for stopping by over our way.